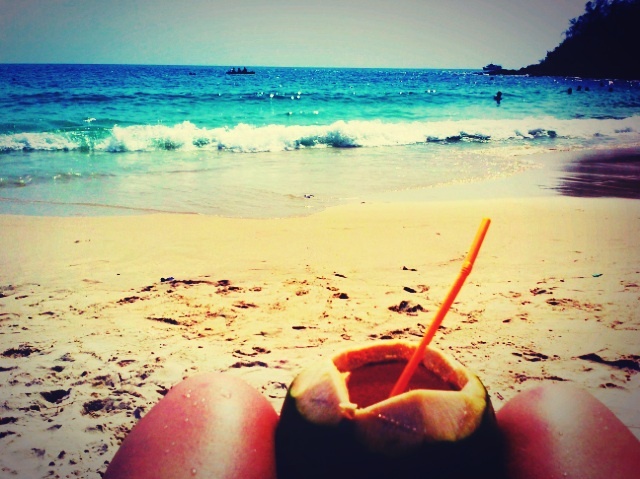 Koh Samet: I wish you were here, or maybe not. I have no intention of making you jealous, but I have to inform you that I am writing this blog post from a beach chair 4 feet from the water on the small island of Koh Samet in Thailand. It is late afternoon and the beach area in front of my resort (My bungalow is $20 a night!) is starting to clear out for the day. I personally think dusk is the best part of a beach day. The sky’s color is spectacular, the sun isn’t as intense as it was a few hours prior and I can finally tell by looking at my skin that yes, I in fact did manage to tan and not burn after hours of frolicking in the surf. I tell you all this because upon traveling to the island from Bangkok, where I spent 3 days being social and saying goodbye to 2012, I have come to the realization that solo-travel may just be the best thing I have done so far in 2013. I admit I was a bit nervous to embark on my solo winter vacation to Thailand. I had traveled alone before but those trips were always only short jaunts from one place to another to meet friends, family or study abroad groups. Because my other expat friends in Korea did not share my vacation days and I knew I didn’t want to stick around Seoul for another week of winter, I booked flights to Bangkok and a hostel for the first night and hoped for the best. Bangkok proved to be a bustling yet non-intimidating and easily navigable city. I’m not sure what I expected, but my desire to be beach-side and maybe Hangover 2 clouded my judgements and I hoped to leave the city shortly after my arrival. I was pleasantly surprised by Bangkok. I spent 3 nights at the Refill Now! 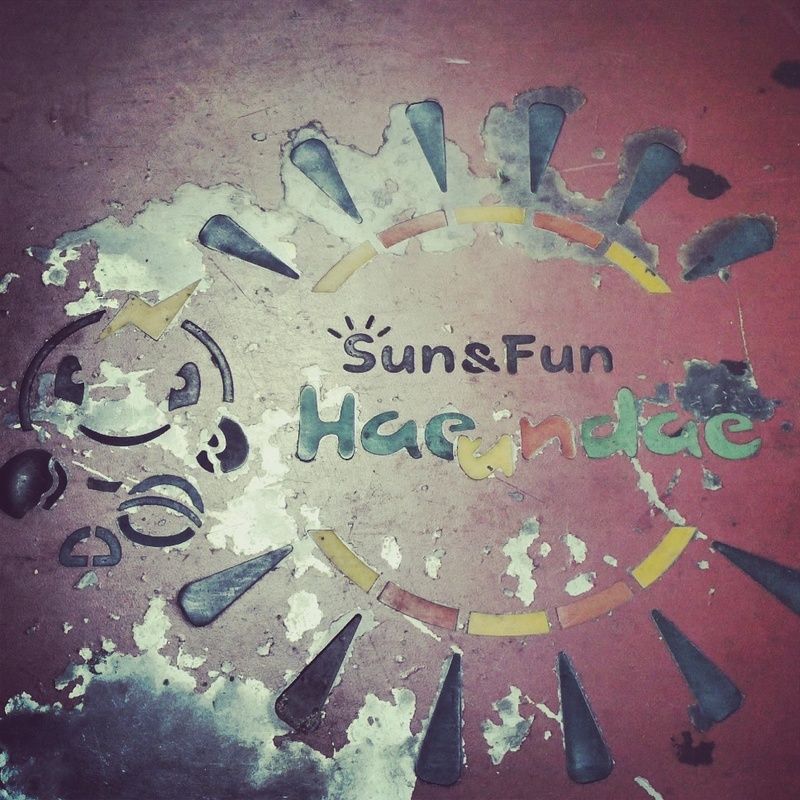 hostel (Please stay here if you are ever in Bangkok!) and made time to explore the splendidly colorful Grand Palace via water transportation, get lost meandering the hundreds of stalls at the famous Chatuck weekend market, wander the backpacker’s party street of Koh San until the early morning hours, and celebrate NYE with a friend from home who now lives in Thailand. After a whirlwind tour of Bangkok I was more than ready to find a map of Thailand and choose an island to getaway to for the remainder of my vacation. My friend had to return to work so I was left to travel solo and any solo-travel-nerves I might have had when I booked my trip a few months back vanished as I made my way to the Bangkok bus station. I was ready for some quality relaxation and I didn’t mind that a few couples and groups of friends eyed me curiously (I think this was just in my self-centered imagination.) on the ferry from the mainland of Rayong to Koh Samet. I think the lone traveler is mysterious. I imagined an outlandish alter identity for myself, although I do think ‘English Teacher in South Korea’ is pretty darn cool and adventurous. My 20 year old self would have been self conscious, I know it. She would have told herself everyone thought it was strange she was traveling alone and that she must be a lonely cat lady. My 25 year old self, having successfully matured (a bit!) and gained some wisdom in a large part due to her year abroad in Korea, brushed these people and their non-existent thoughts aside and realized she would probably never see them again and she was about to embark on an epic island getaway. My first full day on Koh Samet is nearly over and I look forward to 2 mores days of sun and fun. The nice thing about vacationing alone is that you are free to do exactly what you want to do exactly when you want to do it. If I want to sleep in I can. If I sporadically decide to stay in the ocean for an entire hour flopping around pretending to be a mermaid no one is impatiently waiting for me on the beach. If I want to go to bed at 10pm there is no judgement. I have also found that the lone traveler is sometimes the most sociable. While a large group of friends may seem intimidating, when you are on your own you are more likely to be approached by others. On the ferry to Koh Samet I met 2 guys who teach in Japan and were vacationing like me. Many young people at my resort beach have also been extremely friendly. Although I love to socialize, I am using these last few days in Thailand to relax, work on my tan (using SPF! ), catch up on all the books I bought for my iPad in 2012 and recharge for the next few months of teaching in Korea. I would tell you all about the delicious pad Thai I plan to consume tonight, but a beach massage advertisement just caught my eye. A one-hour-full-body-massage for about $9…oh, don’t you wish you were here? 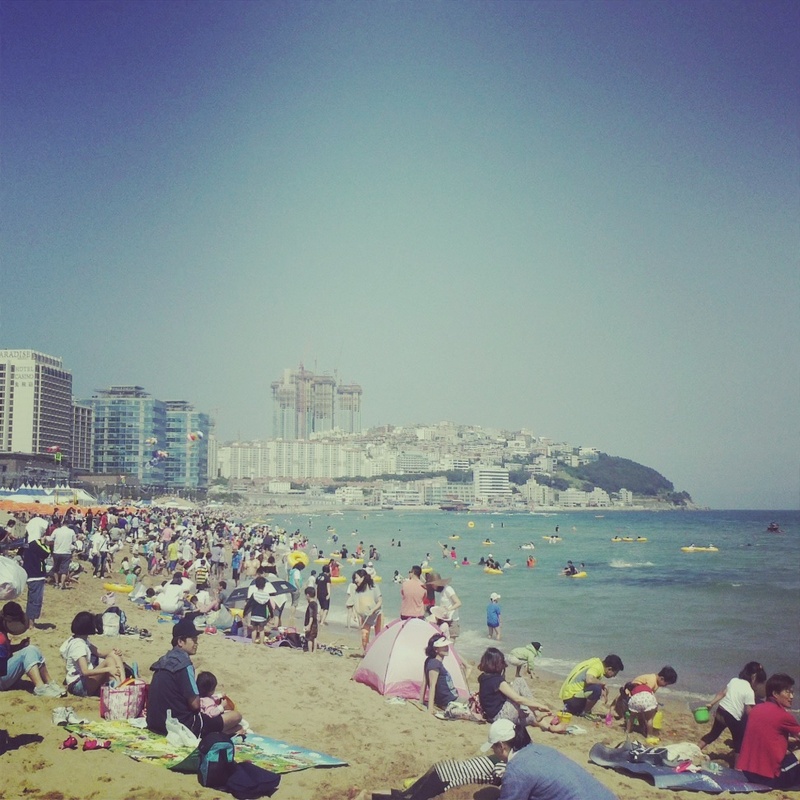 back to the beach – BUSAN! I had no problem hopping a plane from Boston to Korea in the middle of February to teach English in Korea. I love New England, but I have never been a fan of winter. I was born to swim and I live for summers at the beach, as short as they may be. As summer made it’s way to Korea I admit I was a bit homesick for NH beaches and my favorite summer spot, Martha’s Vineyard. 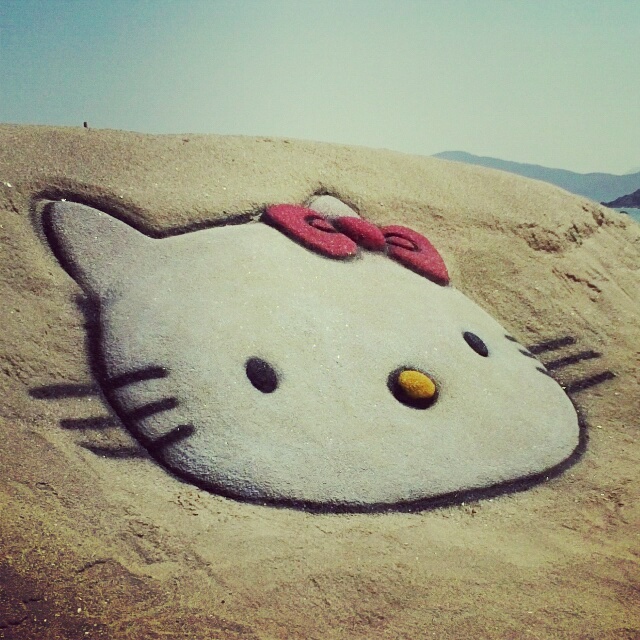 I quickly reached out to my friends in Busan from Chungdahm Training and planned a beach weekend. 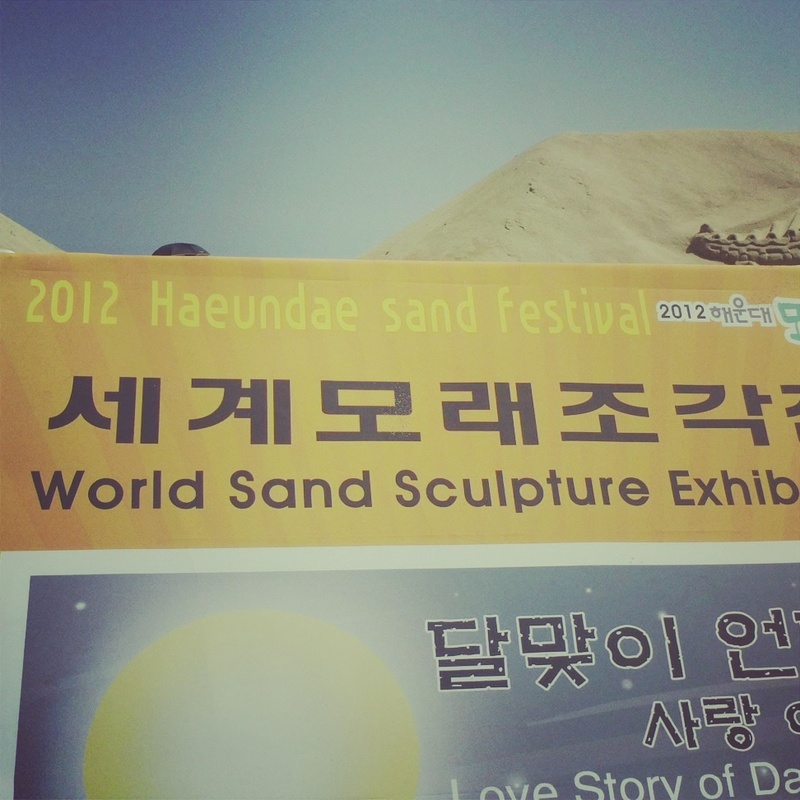 Little did I know, the weekend happened to also be the Busan Sand Festival. Traveling to Busan was simple – I left my apartment early on Saturday morning and made my way into Seoul on the subway and then caught a KTX train to Busan. I was dipping my toes in the water by early afternoon and spent the rest of the day and evening at the beach catching up with friends and swimming as much as possible. 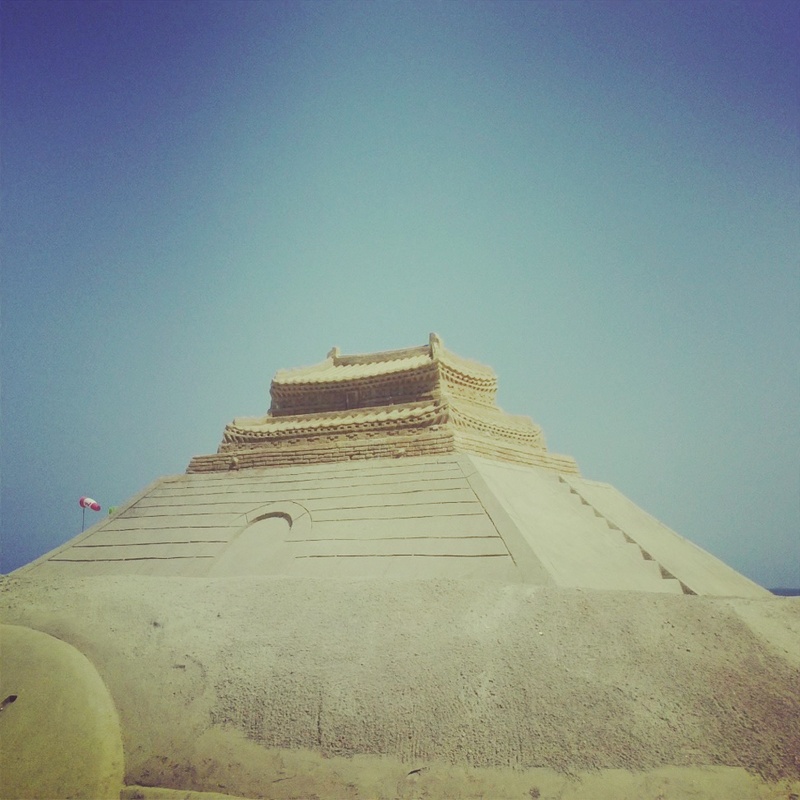 On Sunday, I spent time exploring the sand castles that were on display all along the beach and listened to live music booming from a gigantic stage set right on the sand. I think most of Korea joined me in Busan for the weekend, but I really didn’t mind the crowds. 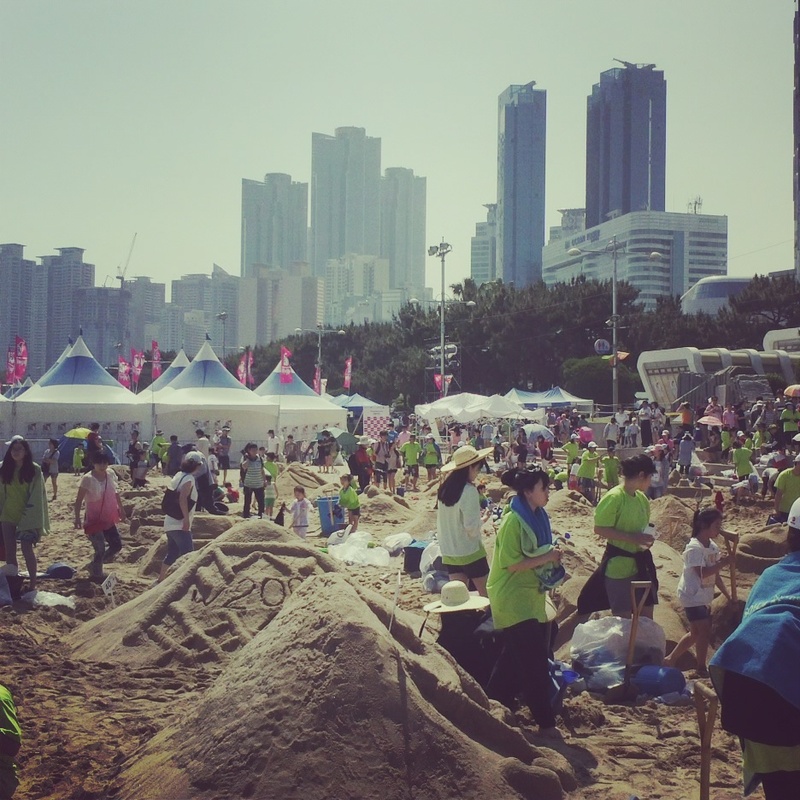 I loved watching the cute Korean kids squeal with delight as they chased waves and intently constructed sandcastles at the surf’s edge. 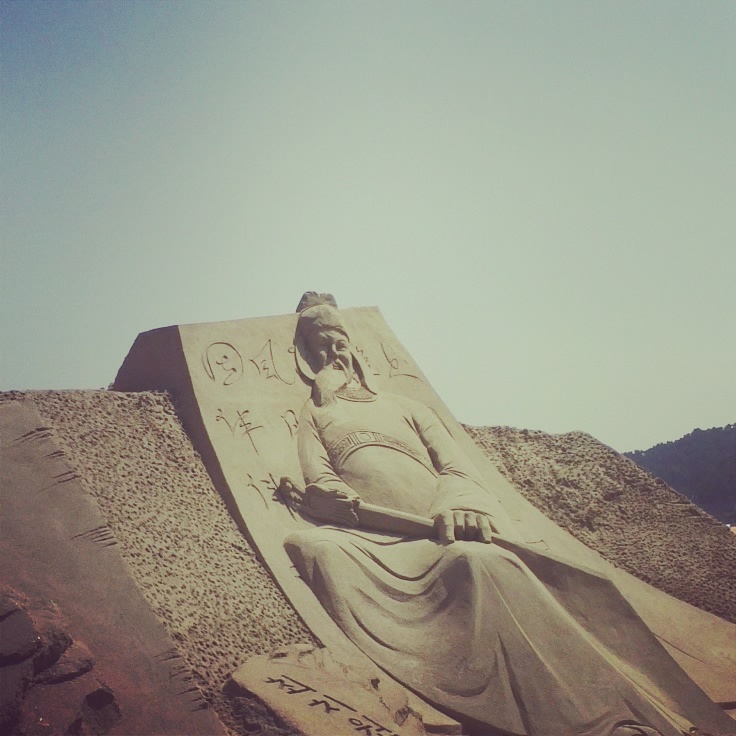 In the sea of Korean families I felt very much at home – I knew that just across the world there was a very similar beach scene taking place. It was all too familiar – a mother lounging on her towel trying to skim her novel while keeping an eye on her kids, a father chasing the little ones into the waves and children making seaweed delicacies for all to try – oh summer I love you – wherever you are! 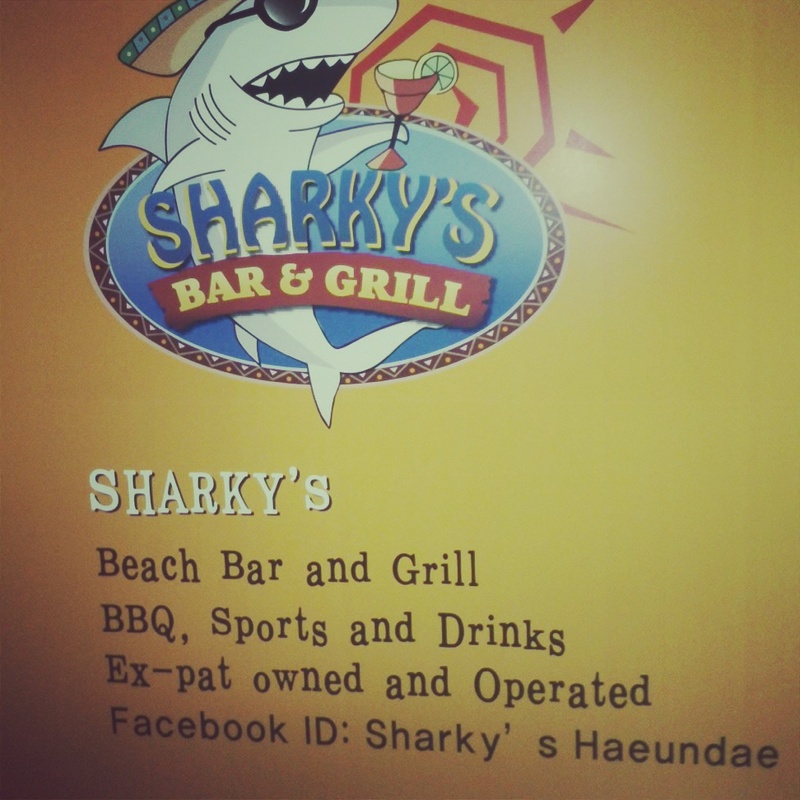 If you know MV you will appreciate this beach restaurant/bar we went to – SHARKYS’! What!? Where am I? Cheers for now…posting this back in my room as my fan blows warm air in my face…missing the beach! Lateral Movements: Working my way around the world. live life: A girl's journey through South Korea.